SEATTLE – Mike Hopkins seemed destined to become a head coach. The surprise is that it’s not happening at Syracuse. 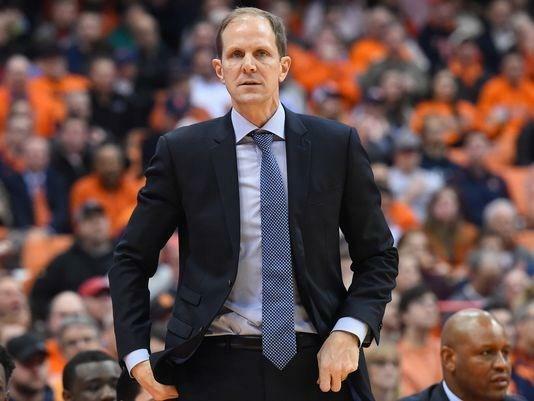 Hopkins has been tabbed as the eventual replacement for Jim Boeheim at Syracuse since 2007. Two years ago, Syracuse put the transition plan in writing, announcing Hopkins would take over after the 2017-18 season. Hopkins also served as interim head coach during a stretch of the 2015-16 season while Boeheim was suspended. Hopkins is leaving behind all he’s known in college basketball for an opportunity to rebuild Washington. “His resume and reputation within the basketball community made him stand out to us, but ultimately it was his vision for Washington, his passion for teaching and developing student-athletes and his close alignment with the core values of our institution and department that made it more than clear that he was the right fit for us,” Washington athletic director Jennifer Cohen said in a statement. Hopkins spent most of the past quarter century at Syracuse as a player and coach. He played at Syracuse from 1989-93 and returned to the staff there in 1996. He was named coach-in-waiting in June 2015, with the expectation he would take over after the 2017-18 season. But Hopkins jumped at the chance to coach in the Pac-12 after being linked the past few years to job openings at USC and Oregon State. Later in the day it was announced that Boeheim has agreed to a contract extension that will keep him at Syracuse after next season when Hopkins had been slated to take over. Romar was dismissed following 15 seasons at his alma mater and the Huskies’ sixth straight season in missing the NCAA Tournament. The decision was divisive because of Romar’s long relationship with the school and his early success in turning Washington into a West Coast basketball power. But that was countered by the team’s recent struggles, its last NCAA appearance coming in 2011. Hopkins is the first major hire by Cohen since she was named to the position full time in May 2016, although she was also instrumental in the hiring of football coach Chris Petersen in 2013. Washington has been trending downward the last half-dozen year despite attracting top talent. The Huskies went 9-22 this season and ended the year on a school-record 13-game losing streak despite having expected NBA lottery pick Markelle Fultz. The 9-22 mark was the school’s worst since 5-22 in the 1993-94 season and the final straw that led to Romar’s dismissal. Hopkins’ first job will be to salvage the recruiting class for next season. It is regarded among the nation’s best and highlighted by Michael Porter Jr., the top-ranked senior. It seems unlikely Porter will now come to Washington given that his father, Michael Porter Sr., was an assistant for Romar. Hopkins’ also must try to keep current players from requesting a transfer, many of them loyal to Romar. Published: March 19, 2017, 4:27 p.m. Updated: March 19, 2017, 10:37 p.m.